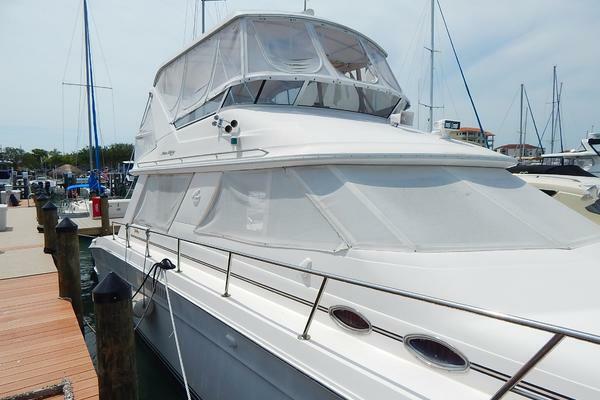 This perfect Live Aboard 1991 Californian Cockpit Motor Yacht built in 1991, Nearly always freshwater; brought to Florida from the Great Lakes has been properly Maintained. The first owner had the oat built for himself in North Carolina, then navigated to Lake Erie where it remained until 2014. Always stored indoor heated during the winters. Second owner is licensed USCG Master of Oceans who maintained this boat well, operated it carefully and pampered the engine room. Successfully navigated to Cuba and the Grand Cayman Islands, She had proved to be seaworthy and can be labeled as a Long Range Cruiser. At top speed, this boat exceeds 24 knots.